YogaFit Kids: How Can YFKids help the obesity epidemic? How Can YFKids help the obesity epidemic? Functional flexibility includes functional strength, especially at the end of range of motion. Holding a stretch at or near the end of range of motion involves strengthening opposing muscle groups. Holding a pose also involves stabilization of adjacent body parts (stabilizer muscles) and coordination among muscle groups as we move through flowing repetitive poses to achieve smooth, adaptable movements. This blend of functional, integrated, strength and flexibility training, using the child’s own body weight, allows the child to listen to their bodies. Because YogaFit Kids instructors teach modifications for the poses, the child has control over how hard he or she wants to challenge his/herself. With proper instruction, the child has the opportunity to create more or less challenge in each pose and to balance challenge with success. Finally, this training uses the real-life function of each muscle group, helping kids to achieve optimal performance in real life, during their activities of daily living. The best yoga programs for children combine playful and creative asana practice with youth exercise physiology considerations for safety, include language and teaching methods that inherently teach the essentials of yogic philosophy to build self esteem and confidence in children, and teach children the importance of “within” time essential to any yogic practice. YogaFit Kids uses mindful movement, games, share cirdes, breathwork, and visualization to move energy through the body as we calm the mind. Classes are multi-age and inclusive. 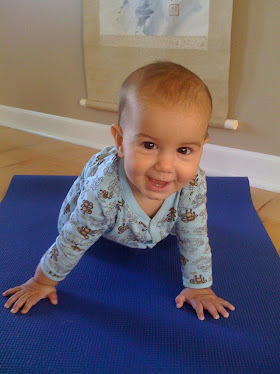 YogaFit Kids allows all children to participate at their own level. YogaFit Kids instructors are taught to not always correct children while in the poses. Children start by holding the poses naturally, in the way it feels best in their bodies, and instructors provide alignment detail over time. We emphasize feeling the pose in the body, instead of perfecting the pose. Labels: How Can YogaFit Kids help the obesity epidemic?